has actively served the community with passion and energy! child abuse prevention, youth projects and Americanism! the Salem Area Chamber of Commerce to the Capital City Exchange Club and the Salem Exchange Club for the Field of Flags event in 2011. So what are “YOU” waiting for? Since it’s charter in 2000 the Capital City Exchange Club has received National and Local recognition for its efforts in community service and participation in fundraising events. Both exchange clubs in Salem sets a standard of cooperation which acts as a model for clubs across the nation and as such is unparalleled! Membership of the Capital City club has driven the new look for the Salem clubs, assisting in the development of membership brochures, the local Exchange clubs web site, improvement of event / fundraising efforts and starting the development of the Forever Family Center fundraising campaign. 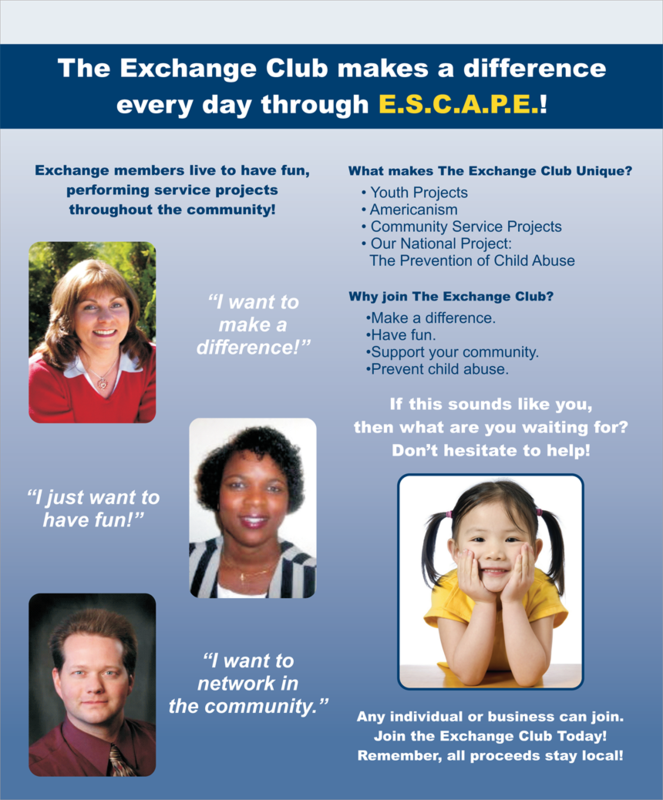 The Capital City club strives to be active and effective in promoting the National Exchange Club programs of service and the national project of child abuse prevention. Membership offers the reward of leadership development, personal development and community service. Our club allows membership in other community groups and excludes no-one! A minimum meeting attendance of 70%. The Capital City Exchange Club meets Wednesdays 4:00pm at the Scottish Rites Center. Scottish Rite is located in at 4090 Commercial St in South Salem. The Capital City Exchange Club membership dues are $100.00 per quarter, which includes the food served at the meetings and also includes beverages. The Capital City Club is always in need of Volunteers! If you are interested in serving your community or have a passion for helping children please use the volunteer form on this website!